INCLUDES: Imperial Stainless Steel Containers (Upper, Lower & Lid), 2 Black Berkey Filters, 2 Fluoride Filters, 4 Hole Plugs, 1 spigot, and one set of easy to follow assembly instructions. 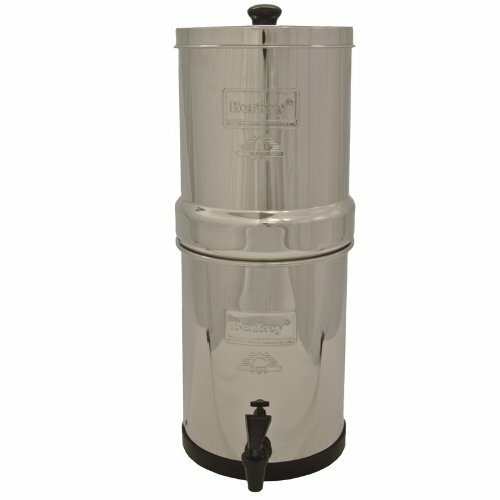 The Imperial Berkey, holds 4.5 gallons of purified water and Filters up to 5.5 gallons per hour (running with the 2 included filters). Made from high grade 304 Stainless Steel and measures 10"D x 27"H. Each (1) Black Berkey Filter Element has a lifespan of 3,000 gallons. That's an incredible 6,000 gallons for a two-filter system. This is possible because of the Black Berkey filter elements' unique ability to be cleaned up to 100 times using a 3M Scotch-Brite pad. Each (1) Fluoride Filter attaches onto the stem of the Black Element, as a post filters, and can filter up to 1,000 gallons (3,785 liters). Each (1) Black Berkey Filter Element has a lifespan of 3,000 gallons. That's an incredible 6,000 gallons for a two-filter system.